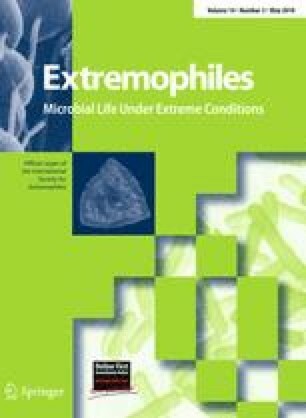 Two extreme halophilic Haloferax strains and one strain each of Halobacterium and Halococcus were isolated from a hypersaline coastal area of the Arabian Gulf on a mineral salt medium with crude oil vapor as a sole source of carbon and energy. These archaea needed at least 1 M NaCl for growth in culture, and grew best in the presence of 4 M NaCl or more. Optimum growth temperatures lied between 40 and 45ºC. The four archaea were resistant to the antibiotics chloramphenicol, cycloheximide, nalidixic acid, penicillin, streptomycin and tetracycline. The strains could grow on a wide scope of aliphatic and aromatic (both mono-and polynuclear) hydrocarbons, as sole sources of carbon and energy. Quantitative measurements revealed that these extreme halophilic prokaryotes could biodegrade crude oil (13–47%, depending on the strain and medium salinity), n-octadecane (28–67%) and phenanthrene (13–30%) in culture after 3 weeks of incubation. The rates of biodegradation by all strains were enhanced with increasing NaCl concentration in the medium. Optimal concentration was 3 M NaCl, but even with 4 M NaCl the hydrocarbon-biodegradation rates were higher than with 1 and 2 M NaCl. It was concluded that these archaea could contribute to self-cleaning and bioremediation of oil-polluted hypersaline environments. The work was supported by the University of Kuwait, Research grant SL 01/08. Thanks are due to the SAF unit and GRF, Kuwait University, for their help in GLC (GS 02/01) and genetic analyses (GS 01/02).